Electricity tariff changes happen almost every year. They are difficult both for the consumers as well as utility (distribution companies). For the utilities, generation of electricity bills become challenging due to varied tariffs for various dates. And for consumers, it becomes difficult to understand the tariff applicable for them. We started Bijli Bachao in early 2012 and one of the first things that we came out with was our electricity bill calculator. And it has been one of the most popular calculator on our website till date. Every time there is a tariff change and we get a lot of requests from people to help them validate their electricity bills. And a latest case we got prompted us to write about it. The person who got this bill was quite confused as the totals on the bill did not match at all (check the slab calculation section). Similarly the other 2 slabs also did not match up. Also the slab units were confusing as ideally the first slab should have been for 250 units, 2nd for 300 units. But the details on the bill did not match at all. 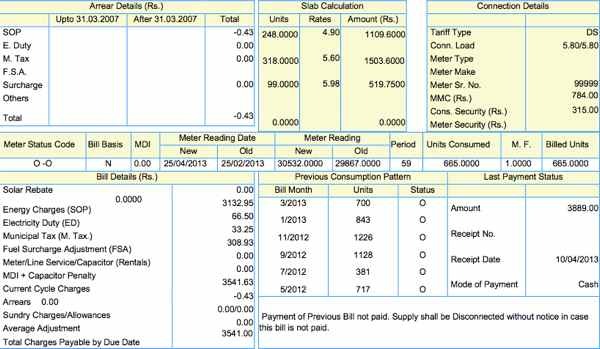 If you look at the bill carefully, the period for the bill is from 25th Feb 2013 till 25th May 2013. Which is about 2 months. The tariff slabs for most utilities are defined for a one-month period (check tariff slabs for various states on our link: Domestic Electricity LT Tariff Slabs and Rates for all states in India in 2013). So in the above case if the rate in the 1st slab was applicable for 250 units in one month, then it should be applicable for 500 units in 2 months, and likewise for all other slabs. So ideally all the units from 25th Feb till 31st March should have been charged at older rate and from 1st April till 25th April should have been charged at new tariff. As there is no way to determine how much was really consumed till 31st March, we can assume that equal number of units is consumed every day. Assuming that, we can say that about 383 units (out of total 665 units) are consumed from 25th Feb till 31st March, and 282 units consumed in month of April. If we sum it up we should get energy charges of Rs 3155 (1751+1404). If you look at the bill, the amount charged is Rs 3132.25. Although the electricity bill looks confusing, the utility or distribution company has tried to adjust it in such a way that the bill value is as close to the actual as possible. This bill that we received was not wrong, but if tariffs have changed in your area recently, please make sure that you validate it before making the payment.